The deployment of Prince Harry's regiment to Iraq has been confirmed by the Ministry of Defence. The prince has always said he wants to be taken seriously as a soldier. He joined the army as a career. He wants to be taken seriously as a soldier, which is why he made it clear after he'd finished his officer training at Sandhurst that he would leave the army if he was left behind when his regiment was sent to a war zone. And so, just as the prime minister announces the start of Britain's phased withdrawal from Iraq, Second Lieutenant Harry Wales of the Household Cavalry, is preparing for a tour of duty in that country. 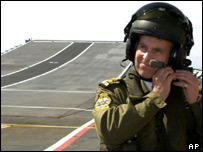 It is the riskiest military deployment by a member of the royal family since his uncle, Prince Andrew, headed off to the Falkland Islands as a Royal Navy helicopter pilot in the conflict of 1982. Harry's departure for Iraq will, self-evidently, pose a significant challenge to those charged with ensuring his safety. To have the third in line to the British throne on active service in what, for a British soldier, is an extremely hostile environment will be an added pressure for Britain's already hard-pressed military commanders. Yet it shouldn't really be a surprise that Harry is going. In purely practical terms, the British operation in southern Iraq still requires the reconnaissance skills that the Household Cavalry, with its light tanks and armoured vehicles, can provide. In personal terms, Harry is keen to go. He is said to have bonded well with the dozen men he commands in his troop. He wants to be there with them; to lead them and to put into practice what he's been taught in training. Furthermore - despite the obvious misgivings about safety - the royal family will want and expect him fully to fulfil his obligations as a serving soldier. If he were first or second in the line of succession the safety considerations would take precedence. But, unlike his elder brother, Harry has the freedom to pursue a (relatively) orthodox military career and show what he's capable of. It shouldn't be forgotten that there is no constituency with which the royal family has closer emotional or instinctive ties than the armed forces. It is still the case that the majority of male members of the family have served in one or other of the forces' branches. From the Duke of Edinburgh's wartime service in the Royal Navy, via the army careers of the Kent brothers (the Duke, 21 years: Prince Michael, 20 years), to the naval service of Princes Charles and Andrew and, now, the army careers of Harry and his elder brother William. 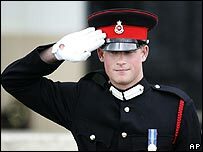 Harry's deployment to Iraq with the rest of his men from 'A' Squadron of the Blues and Royals is an example of the royal family standing alongside the families of other British soldiers, sailors, marines and airmen. A grandmother's anxiety is much the same in Windsor as it is in Wallasey or Wick, and in the context of this particular conflict, it is an anxiety which may perhaps be exacerbated in all of those places by doubts about the purpose of the whole endeavour. But Second Lieutenant Harry Wales will be there, doing his duty with the rest of his regiment, while his father, elder brother and grandmother will - with several thousand other British families - suddenly have a very personal stake in the progress of this particular campaign, and an insight into the stresses that it can provoke. They may even find themselves reflecting that not a single senior member of this government, the ministers of the Crown who committed Britain to the Iraqi intervention, has had an equivalent experience. What next for Prince Harry? Should Harry have come home?